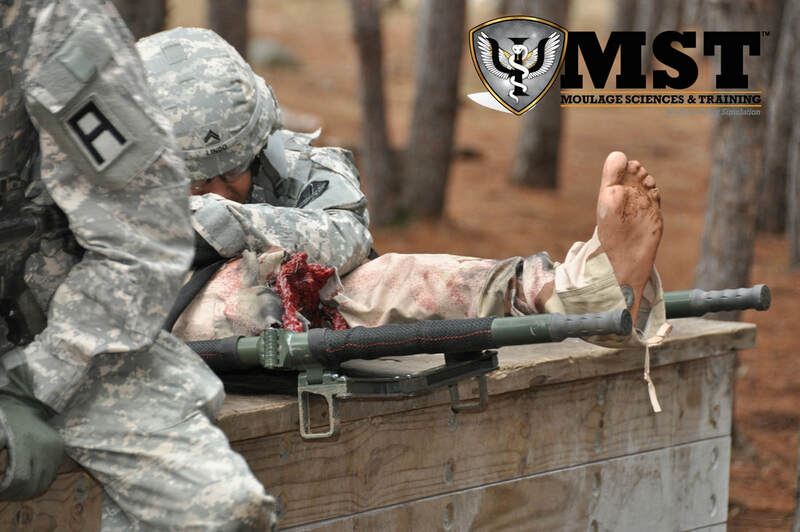 Merging the latest special effects technology with advanced materials, MST recreates the intensity, complexity and stress of emergency trauma care. We offer a comprehensive portfolio of immersive training products from injuries to clinical applications that allow medical professionals to practice and achieve skill mastery in a myriad of emergency medical procedures and scenarios. MST offers a variety of training courses designed to help you reach your greatest potential in the field of moulage. In addition to our standard course catalog, custom classes can be designed and delivered to meet your unique requirements. Our instructors have an extensive professional background, including special effects makeup for film and television, fine art, and science. Our skilled professionals can create custom moulage for your exercise or drill using a variety of professional products and techniques. We have traveled all over the country with professional special effects makeup artists to do moulage for a multitude of scenarios, including military training, disaster drills, professional demonstrations, and hospital triage. Severe medical trauma creates major challenges for military & civilian first responders. Traditional classroom training is essential but no substitute for actual experience in the field. Bridging the gap is moulage, the art of applying mock injuries for the purpose of simulating real-world experience for emergency medical training. In use since for centuries, moulage ranges in complexity from simple wax models to hyper-realistic prostheses with pumping blood and simulated odors. When I walked into the Moulage Sciences & Training (MST) production facility for the first time, I saw the moulage across the room and could not tell whether the wounds were moulage or real. I knew at that point these products were different—better. I continue to be impressed with the innovation, realism, and durability.